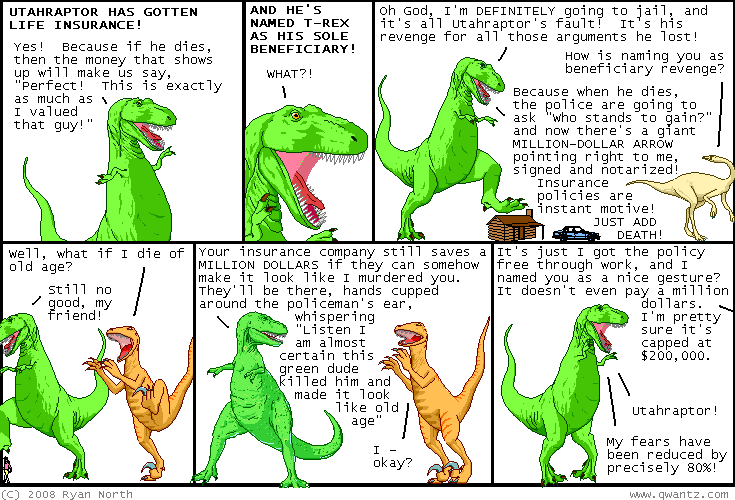 Dinosaur Comics - November 19th, 2008 - awesome fun times! November 19th, 2008: Andrew pointed me towards this story about an alternate history theme park called "Dinosaur Kingdom" in which the American Civil War was won by the North because they had access to dinosaurs. Check out the Flickr streams of dpcshot and Mr. Kimberly for more photos. I linked to my two favourites! One year ago today: people in england: here in canada we find your british swears to be absolutely charming! the angrier you get the more we say, "hah hah hah, awwww."